Spring is tip-toeing in and I’m delighted. Despite some snowflakes last week, a family of chickadees moved into our birdhouse and the air is now warm and filled with the scent of freshly cut grass. Long-simmering stews are fading from memory and being replaced by spring’s bounty. 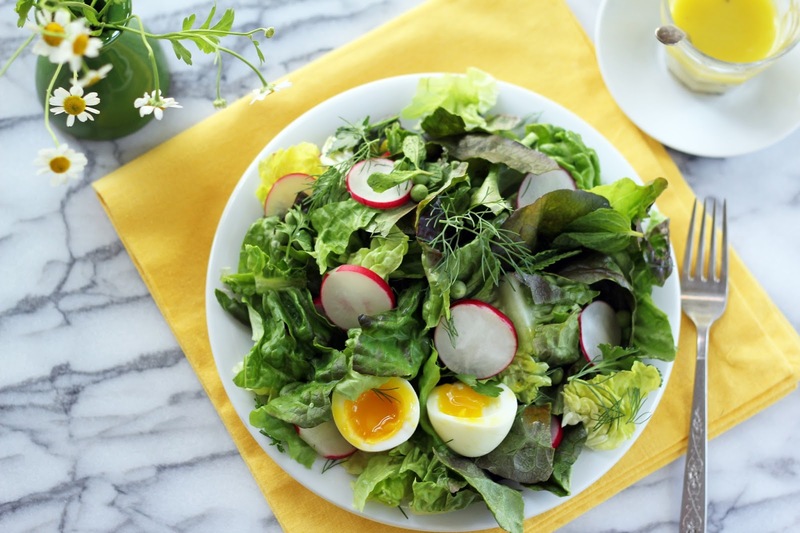 With all the matzah and chocolate macaroons we are eating for Passover this week, a spring salad is really quite welcome. When I spotted this pretty head of lettuce at the market, it reminded me of a blooming flower and I couldn’t resist picking it up. 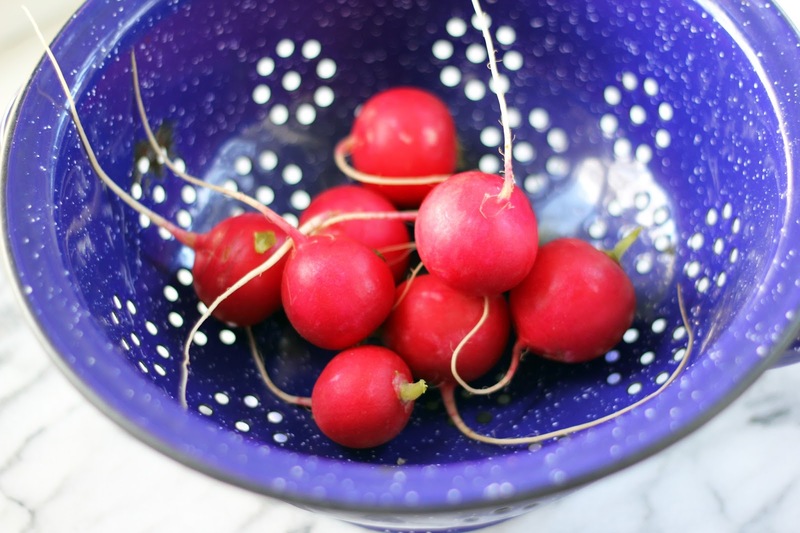 What better way to highlight the crisp radishes and tender peas that were already in my basket than with a salad? Once home, I soft-boiled a few eggs to include. Another happy sign of spring has been our chickens actively laying again. Their clucks announcing a new egg each day can be heard around the neighborhood! 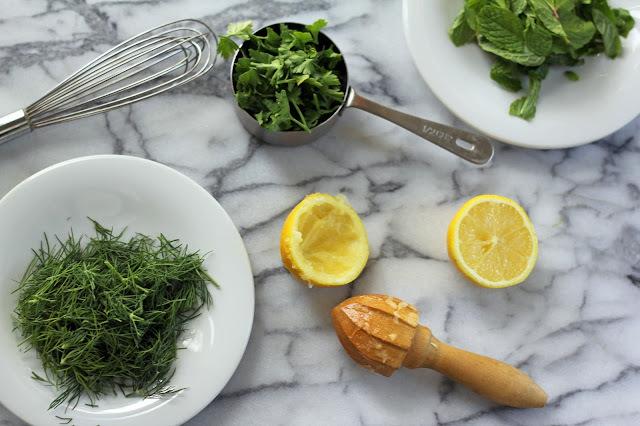 The kitchen filled with marvelous scents as I chopped dill, mint and parsley. I tossed the fragrant herbs with sliced radishes, young peas and the gently torn up head of gorgeous lettuce. A zippy dressing of lemon, honey, Dijon and olive oil completed the salad nicely. In each bite, there was a bit of soft and a bit of crunchy. 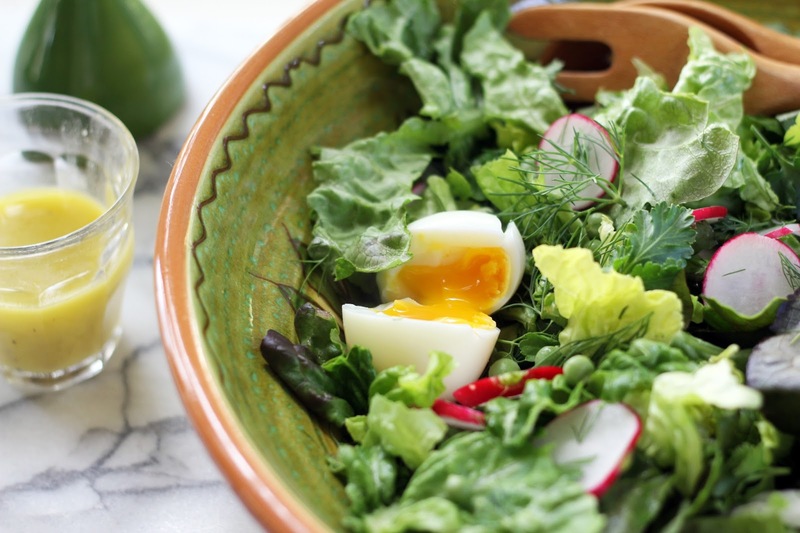 The eggs lay nestled in the baby lettuce leaves, their luscious egg yolks mixing beautifully with the bright dressing. This salad just bursts with fresh flavor, much like the buds bursting into color on our plum tree. And I think it’s best enjoyed while gazing out at the hummingbird feeder hanging from said tree. In a large salad bowl, tear the lettuce into bite-sized pieces. Add the fresh herbs, radishes and peas. Cook’s Illustrated recently shared the best method for soft-boiling eggs. Bring 1/2 inch of water to a simmer in a pan. Gently place your eggs in it and cover. Set a timer for 6 minutes. Remove the eggs from the water and run them under cold water. 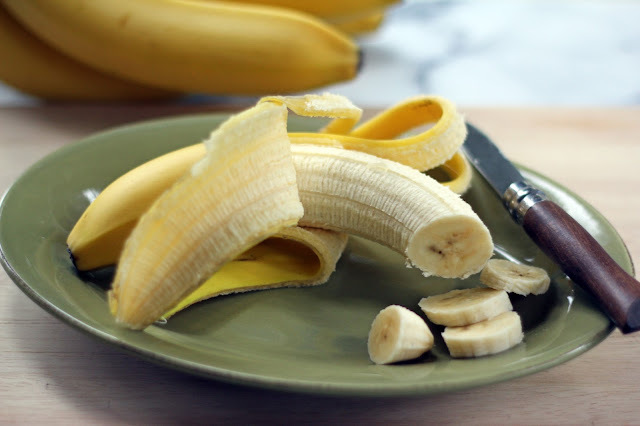 Peel and then slice open when ready to eat. While your eggs are cooking, whisk the lemon juice, Dijon, honey and olive oil together. Add the pepper and salt and taste for seasoning. Divide the salad among 4 plates. 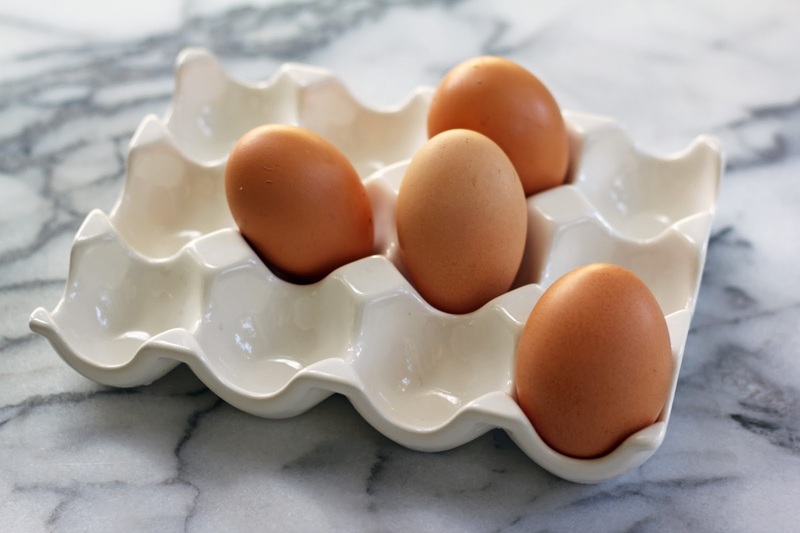 Place an egg on each plate and slice it open just before serving. Drizzle some dressing on each salad and enjoy. Spring has arrived, and in celebration I brought home tulips today and painted my toes pink. Between the pouring rain and lashing wind, though, it’s not feeling particularly spring-like yet, but once I start thinking of the balmy days ahead there’s no stopping me. Having Passover fall in March this year is creating a bit of a scramble as I scrub the kitchen and clear out all the hametz (leavened items like pasta and bread). Fortunately, I also get to plan the seder menu which is so much more fun! A seder is the traditional Passover dinner that celebrates the ancient Israelites’ journey from slavery to freedom. 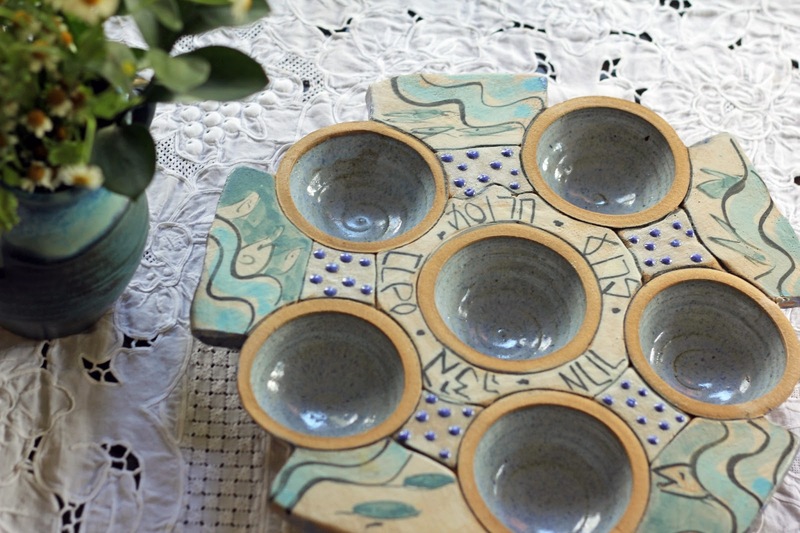 I also get to dust off my seder plate, which is used to hold symbolic foods during the seder. I love our seder plate! Bob and I brought it home from a pottery co-op in Jerusalem back in 1994, where we celebrated our 1st wedding anniversary. Such special memories. I keep a Passover file with each year’s notes, suggestions and recipes I want to try. Once it’s all spread out over the dining room table, I get out my pen and notepad and start planning. 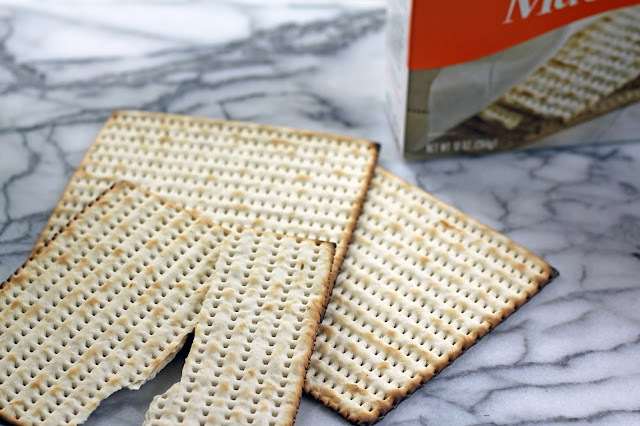 We have eight days of eating unleavened foods (including matzah roca! ), which leads to some creative cooking that I truly enjoy. One of the symbolic foods we put on the seder plate is haroset. 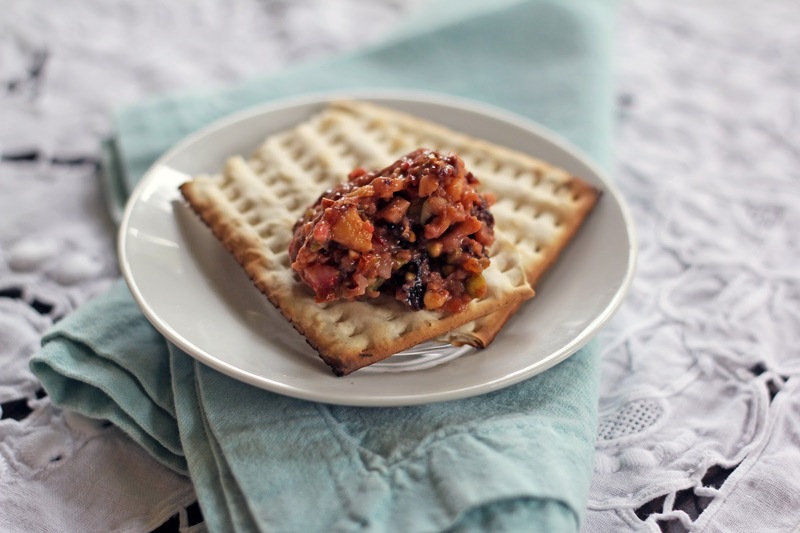 Haroset is typically made of fruit and nuts mixed with wine and spread on matzah to eat. The chunky mixture represents the mortar that the Israelite slaves used when in Egypt. Haroset is made with a quick blitz in the food processor or you can crunch it together with a mortar and pestle. 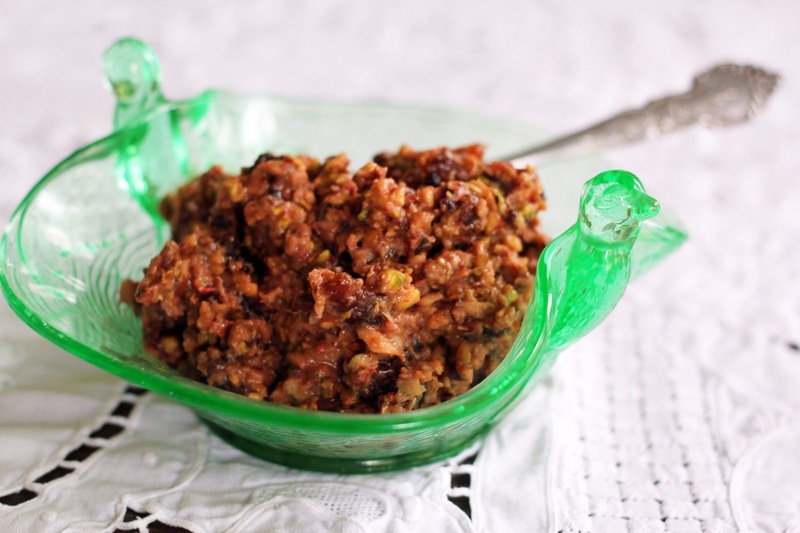 The most familiar version is made with chopped apples, walnuts and sweet wine. There are many different harosets reflecting different Jewish cultures. Suriname, Egypt, Yemen and Turkey are just a few – you can take a trip around the world just eating haroset! Each year, I like to do a haroset tasting and sample some different flavor combinations. There’s one haroset that’s always on our menu, though, and it’s this one: our house haroset. I discovered this Persian-inspired recipe almost twenty years ago, when Joan Nathan’s book Jewish Cooking in America was first published. 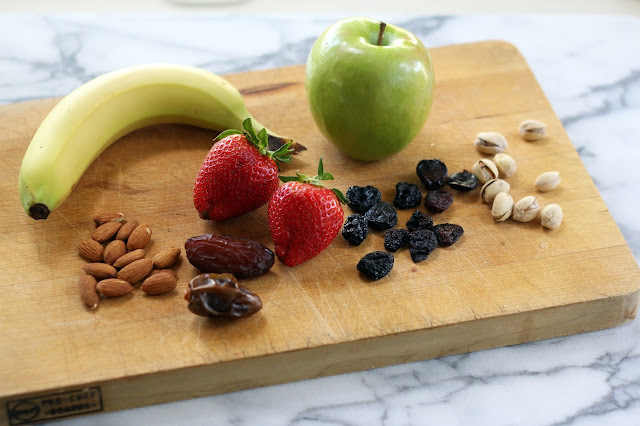 It includes strawberries, dates and bananas in addition to apples and nuts. Sweet, spicy, soft and crunchy ... let’s just say it was love at first taste! I’ve changed a few ingredients and spiced it up a bit over the years and it’s become a family tradition. Some of my favorite times volunteering in my sons’ Jewish elementary school were when I taught each of their classes to make this haroset. I roughly chopped up dates, strawberries, bananas and apples and let the students scoop the ingredients into small bowls and sprinkle on cinnamon and a splash of cherry juice. Then their little hands got busy pounding away with wooden spoons to create a chunky paste. We slathered the haroset on matzah and happily snacked away. Combine all the ingredients in the bowl of a food processor. Pulse the mixture until a chunky paste is formed. 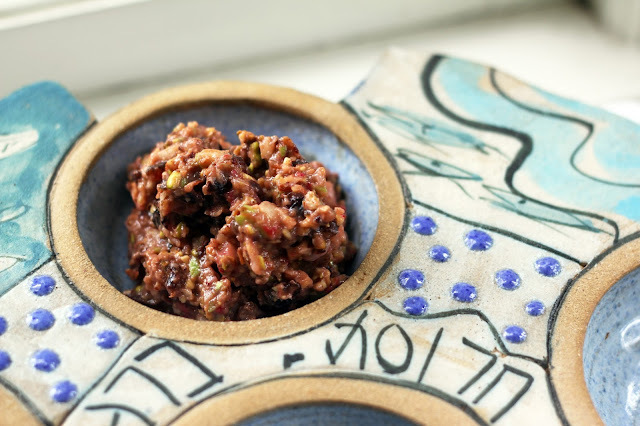 Spoon the haroset into a bowl to serve alongside matzah. It can be made a few hours ahead and kept covered in the fridge. Haroset also makes a marvelous breakfast when spread on matzah (or toast) with some cream cheese. Now this was a fun title to type! Advieh, kuku and barberries are not usually words in conversation for me, but now happily they are becoming more so. 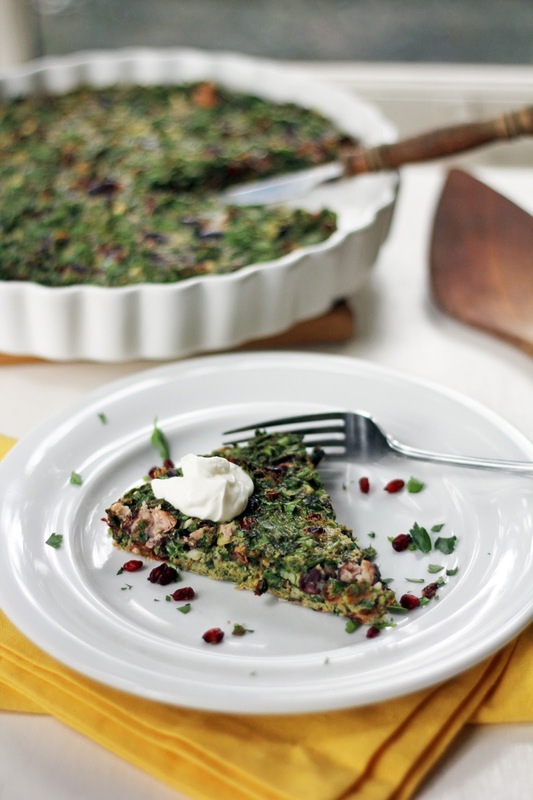 For our cooking adventure with Tasting Jerusalem this month, we’ve been feasting on barberries. When shopping at our local Middle Eastern market recently, Goodies, I noticed dried barberries in the fridge section and thought of picking some up. Later that same day I learned they would be our cooking ingredient for March! It was meant to be, and the next day I had a stash of barberries in my fridge. Barberries are tiny, ruby-colored berries that are common in Middle Eastern cooking, particularly in Persian cuisine. 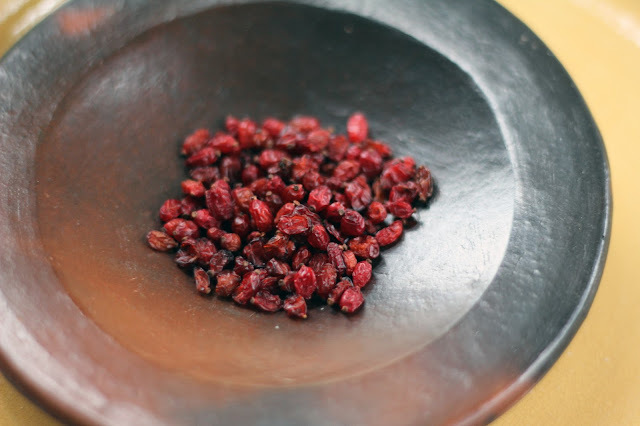 Often, dried cranberries or cherries are substituted in recipes if barberries are not available. I appreciate their burst of tart flavor and the pretty pop of crimson color they add to dishes. A dish I’d been eager to make from Jerusalem: A Cookbook that includes barberries is the Fava Bean Kuku. A kuku is a Persian egg dish, similar to a frittata. 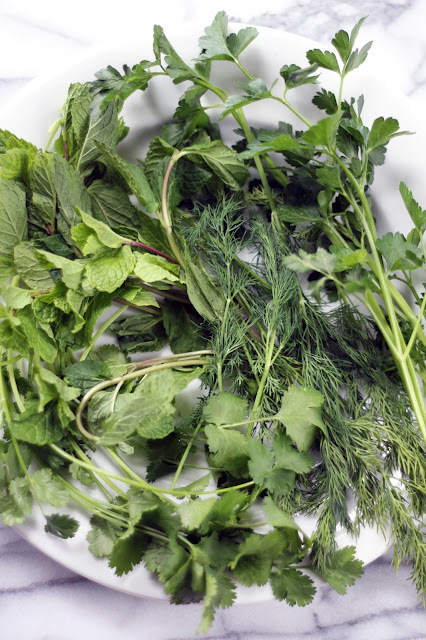 Fresh herbs, veggies or sometimes meat are combined with eggs and spices, cooked and served in wedges. Our family loves egg dishes (scrambled eggs are our fast food) and I’ve made fresh herb kukus in the past, so I knew we’d like one with beans in it. We do not have any fresh fava beans yet, so instead I substituted kidney beans. I also added parsley, chives and cilantro in addition to the dill and mint that were already in the recipe. Another change I made to the kuku was the spices used. I have a long love for Persian food which began when I was a student at UCLA. Shamshiri Grill was my favorite restaurant, and we still make a point of eating there whenever we visit LA. A few years after moving to Seattle, I bought A Taste of Persia by Najmieh Batmanglij and my copy is now spattered and worn. A spice mix that is common in the kukus and many other recipes in this book is a Persian blend called advieh. 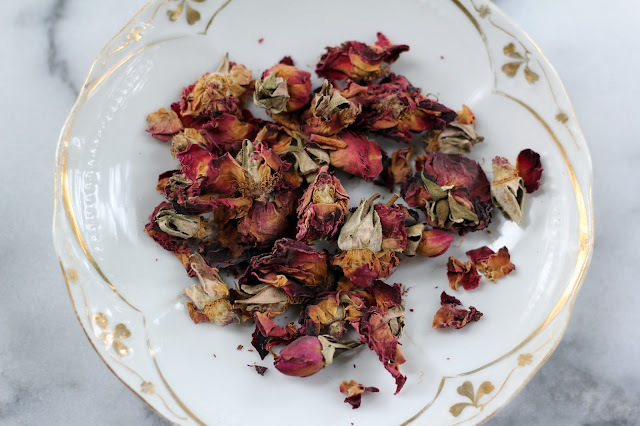 The basic recipe includes dried rose petals (of which I have a large bag after last month’s cooking! ), cinnamon, cardamom and cumin. As you may know by now, I can’t resist an opportunity to make a spice blend! 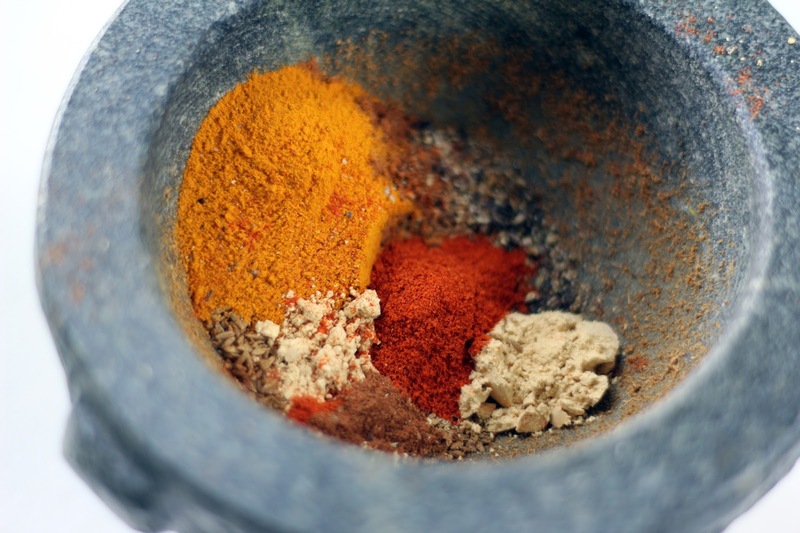 After a little further reading, I learned of other spices that can be included, too, and set out to make my own mix by adding coriander and nutmeg to the basic recipe. I love the research and learning that cooking from Jerusalem inspires! The advieh adds a marvelous touch of dusky, warm spice to the kuku, the fresh herbs sing of spring, and the barberries are little bursts of welcome bright flavor. I served wedges with dollops of thick yogurt and it made a lovely, light supper. 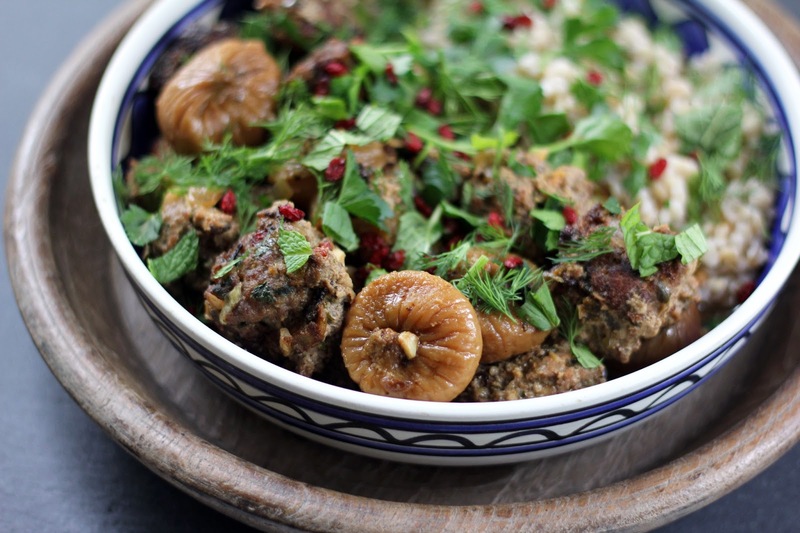 Another stunning dish that comes from Jerusalem is the Lamb Meatballs with Barberries. Ground lamb is mixed with parsley, spices and barberries to create meatballs which are fried and then simmered with figs in chicken broth and white wine. All I can say is wow ... this is a heavenly dish. The barberries provide a tartness that complements the rich lamb nicely. The figs blend in beautifully and the finished dish is showered in chopped, fresh herbs. I served it with barley and we were all very happy. Stir all the spices together until blended. Store in a covered jar and keep in a cool spot. Place the barberries in a small bowl and cover with warm water. Set aside to soak. Preheat the oven to 350 degrees. Butter a 10 inch quiche pan and line the bottom with parchment paper. In a large mixing bowl, whisk the eggs together and add the rice flour, baking powder and advieh. Stir until the flour, baking powder and advieh are well mixed. Add the garlic, fresh herbs, kidney beans, salt and pepper and gently stir together. Drain the barberries and stir them into the egg mixture. Pour the egg mix into the prepared quiche pan and pop it in the oven. Bake for about 35 minutes, until the kuku is puffed and firmly set. Remove from the oven and serve warm with dollops of plain yogurt. 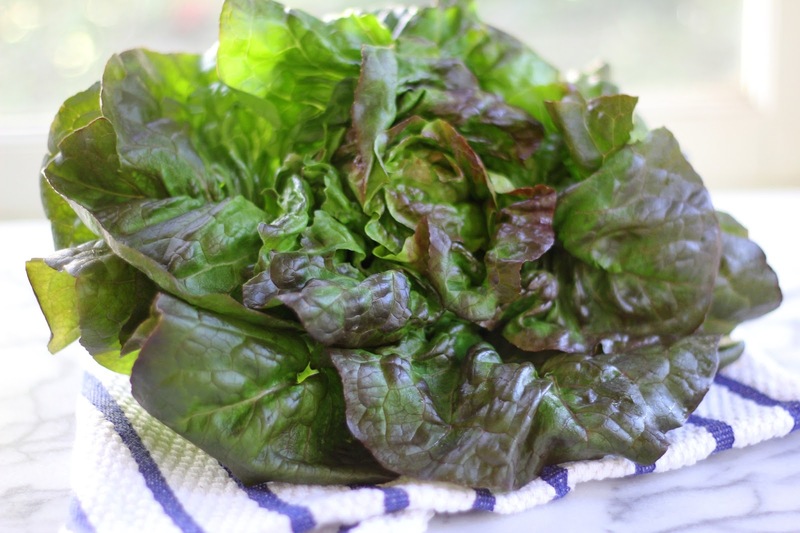 While eagerly awaiting the first baby leaves of lettuce, I am still loving winter’s bounty and have discovered a new way to enjoy greens as we transition into spring. Meet the Waldorf Kale Salad! 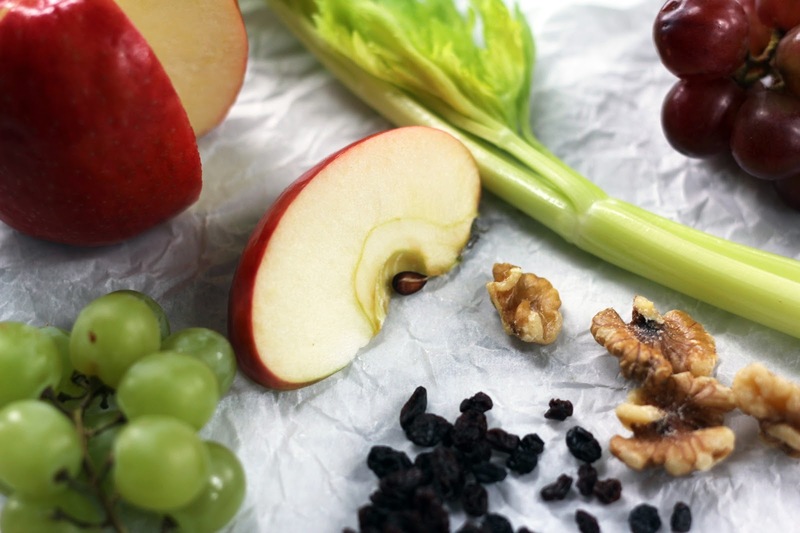 The Joy of Cooking tells us that the Waldorf salad was created by Chef Oscar Tschirky of the Waldorf-Astoria Hotel in the late 1890s. Originally, this salad contained only apples, celery and mayonnaise. It has since evolved to include walnuts, grapes and occasionally even little marshmallows. It always, though, has a creamy dressing, typically made with mayo. While I’ve eaten many Waldorf salads, I hadn’t made one myself until recently, when I stumbled upon a marvelous riff on the Waldorf salad using kale. I have already made variations of it three times! Right away I loved this salad when I read that the thick dressing is made by pureeing apples and walnuts together with Dijon and red wine vinegar. No mayo! For my salad, I added a few grapes to the mix and swapped in some lemon juice for the vinegar. 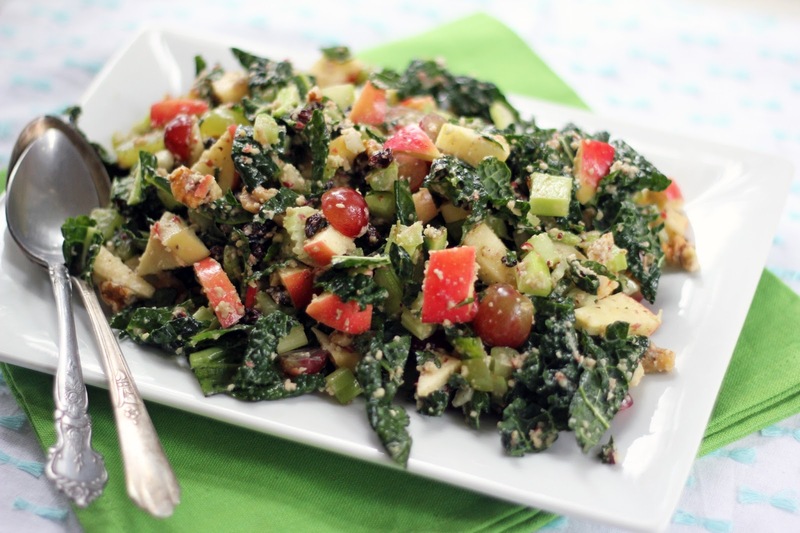 The result is a bright, zippy dressing that clings to the kale and wakes up your taste buds. Even if you’re looking forward to leaving kale behind with the winter, I think this bright, punchy salad will please. 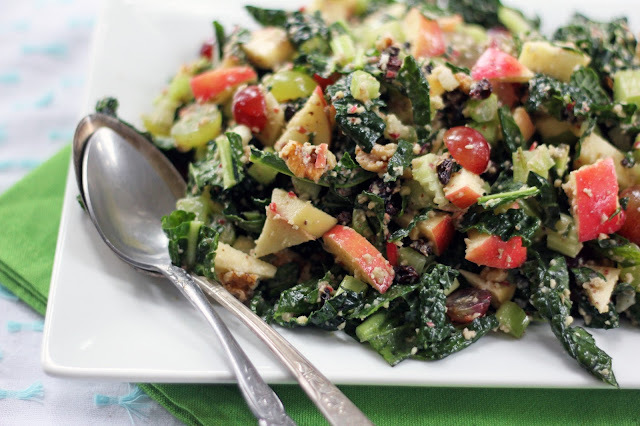 It’s packed with flavor and crunch from apples, celery, currants and walnuts and is loaded with the goodness of kale. An added bonus is it will hold up well once dressed and can be made ahead. As we ease into spring, we begin to lighten our eating and this refreshing new twist is a terrific option and already a staple in my repertoire. Slice one of the apples in half and core it (no need to peel). Roughly chop one half and place in the bowl of a food processor. Add 6 grapes to the food processor bowl, 1/4 cup walnuts, 2 tablespoons currants, the Dijon mustard, lemon juice and salt to the food processor and puree until it forms a thick dressing. Set aside while you prepare the salad. Core and dice the other half of the apple plus the remaining apple and place in a serving bowl. Slice the remaining grapes in half and add to the bowl. 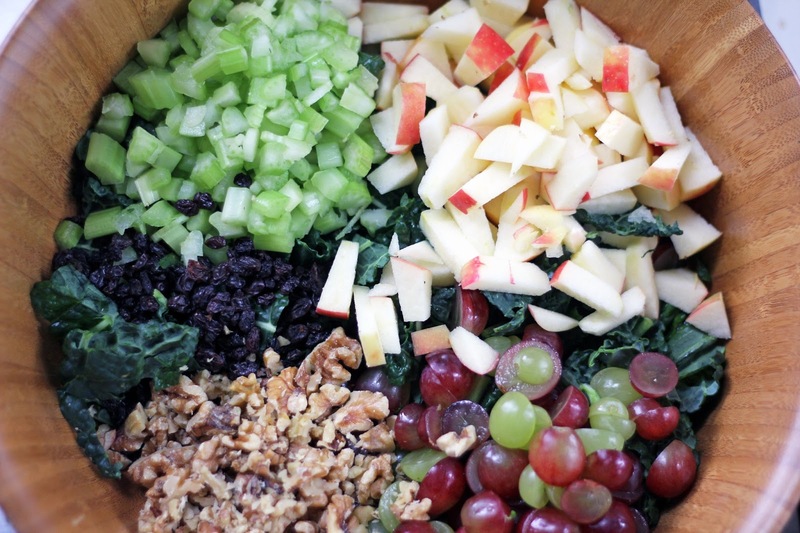 Add the remaining 1 cup chopped walnuts and 1/2 cup currants, all of the kale and the celery. Gently toss to mix. Pour the dressing over the salad. Since it is thick, I found it easiest to dress the salad with my hands. 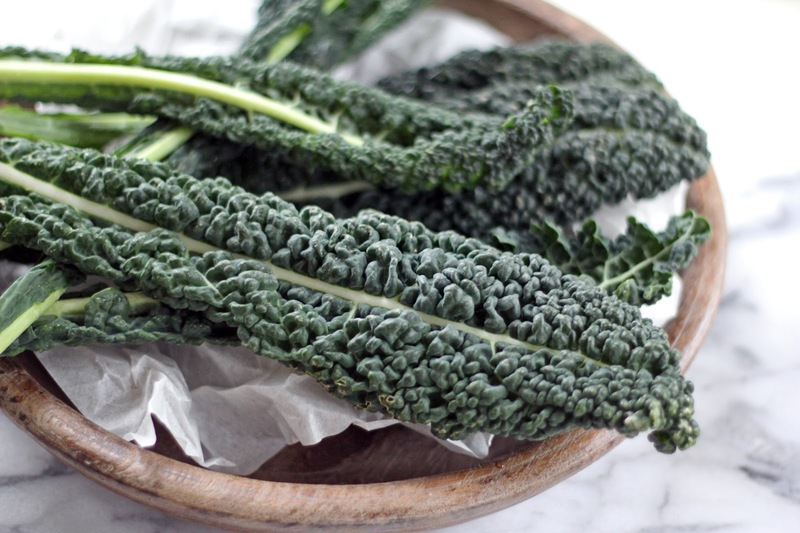 Gently toss the salad with your fingers until the kale is well coated. Taste for additional salt and lemon juice and add more if needed. The salad can be made an hour before serving and kept in the fridge. Gently re-toss before serving. Long ago, when I lived in Southern California, my friend Rebecca and I went on a valiant search for the best pancakes. We ate lots and lots of pancakes. Many a Saturday or Sunday morning was spent squished into a booth or patiently waiting in line at a diner, wondering if we’d find the pancakes. For a while, the pancakes at Babalu’s in Santa Monica were contenders, but then we discovered Coyote Grill in Laguna Beach and knew we were home. See, we adored banana pancakes. The ones at Babalu had bananas sliced on top, which was good. But Coyote Grill cooked bananas into their cakes and that was the best. Plus, Coyote Grill was located just a few doors down from my boyfriend (now husband). What could be better? Recently I’ve been playing around with different flours and almond flour is emerging as a favorite. 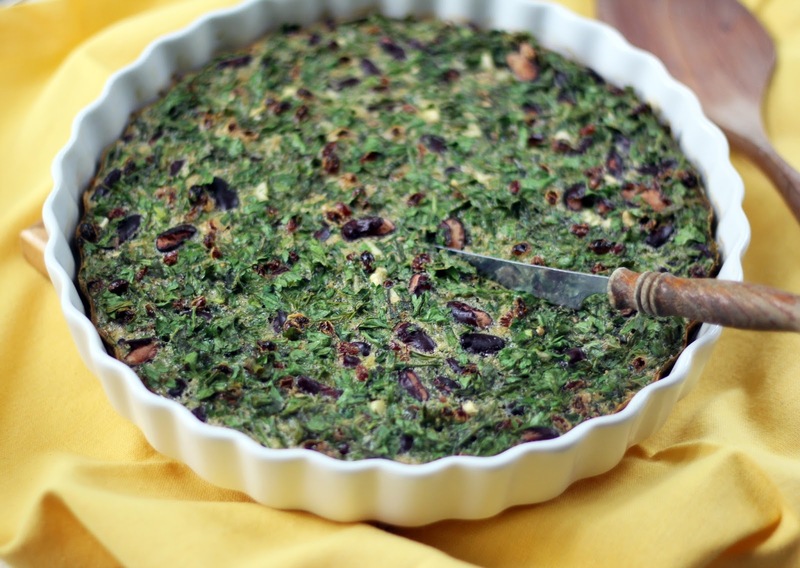 I enjoy its nutty flavor and moist texture, plus it’s loaded with protein. Perfect to start the day! So when a pancake craving hit, I started stirring some batter with almond flour. This is a simple batter to mix up. 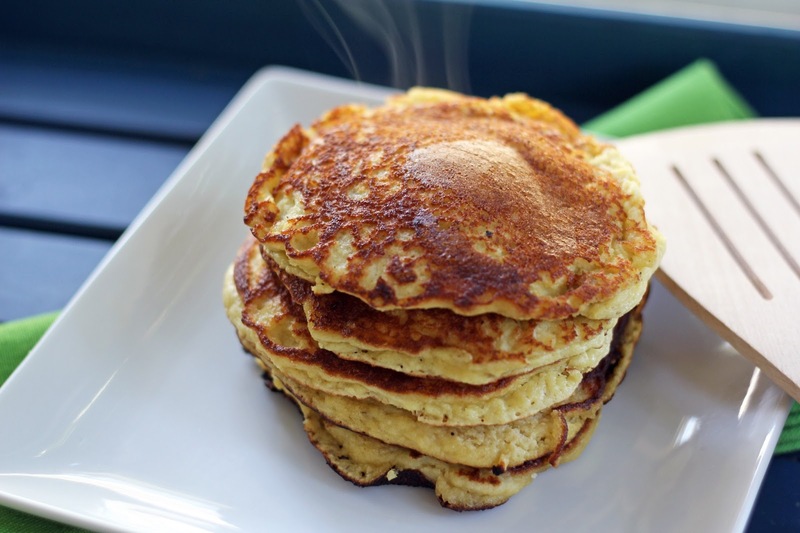 Some almond flour, eggs, milk (I use either whole or almond), maple syrup, vanilla and olive oil come together quickly and you’re frying in no time. Of course, there are mashed bananas in there, too! 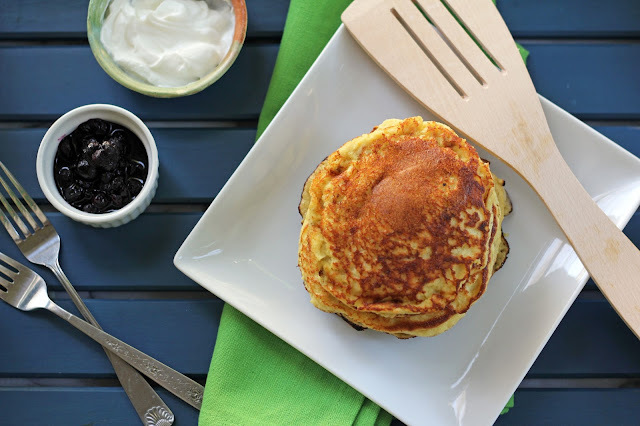 Hot out of the skillet, these pancakes are tender and infused with banana goodness. I like to drizzle mine with pure maple syrup or sometimes a dollop of thick yogurt. This time, though, I made blueberry compote to accompany them since my second favorite kind of pancakes are blueberry. A happy morning indeed! In a medium sized mixing bowl, stir the almond flour and baking powder together. In a 2 cup glass measuring cup, measure the milk and then add the eggs, vanilla, olive oil, maple syrup and mashed banana. 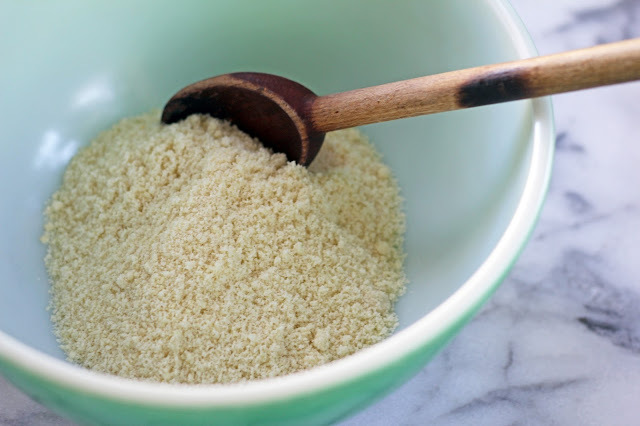 Whisk the wet ingredients together until well mixed and then stir into the almond flour until just mixed. Heat a skillet over medium high heat and melt a bit of butter or coconut oil in it. Scoop 1/4 cup amounts of batter into the pan (as many as will comfortably fit) and fry the pancakes until they are golden and beginning to bubble, about 3-4 minutes. The pancakes are a bit delicate, so very gently lift around the edges of each one and flip to cook on the other side, about 2-3 minutes. Remove from pan and finish frying any remaining batter. 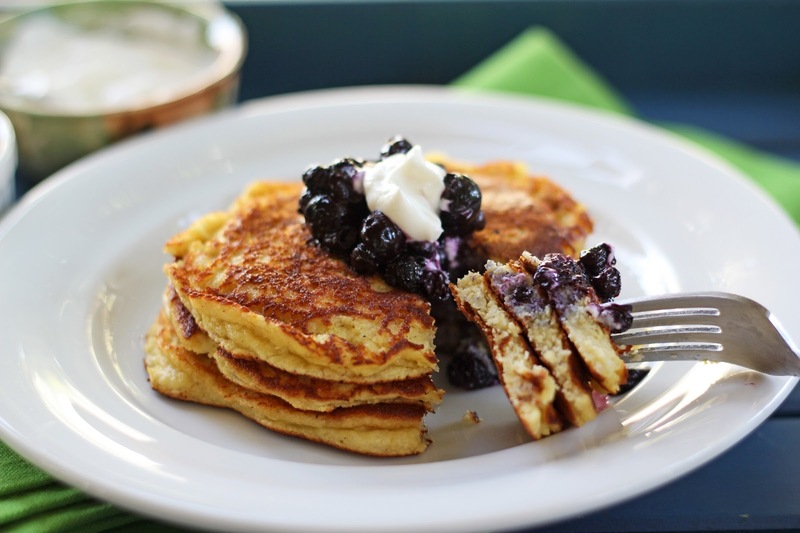 Serve with Blueberry Compote and Greek yogurt. Combine all ingredients in a small sauce pan and bring to a boil over high heat. Lower the heat and let simmer for about 5-6 minutes, until it thickens slightly. 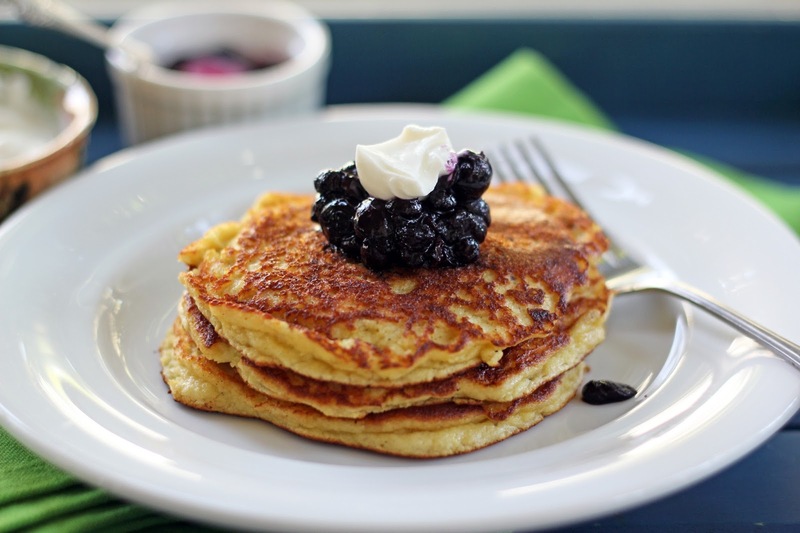 Serve warm or room temperature with the pancakes. This recipe is featured at Foodie Friends Friday. 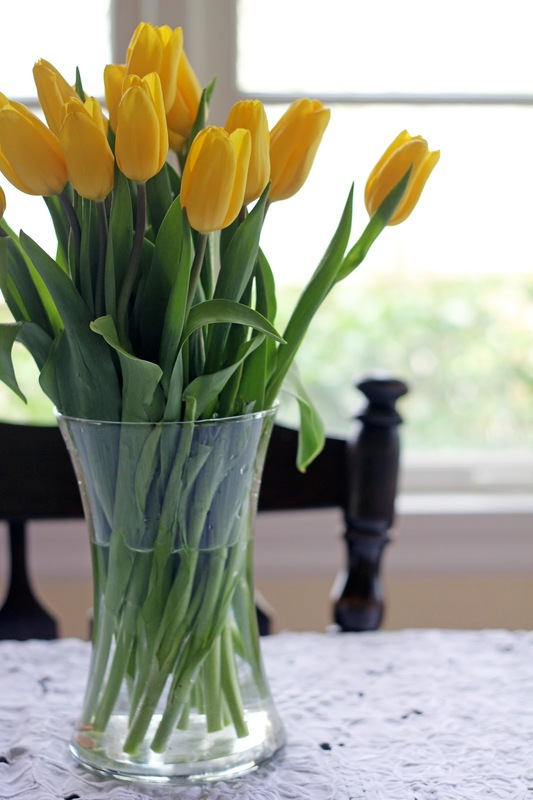 February was all about roses – cooking with them! Rose water and dried petals were the ingredients of choice as I virtually cooked along with others in our Tasting Jerusalem group. It is truly a pleasure to learn, share and discover together. Hopefully some of us will be able to cook in person together, or maybe even meet in Jerusalem (I’ll be there in August!) ... one can dream. 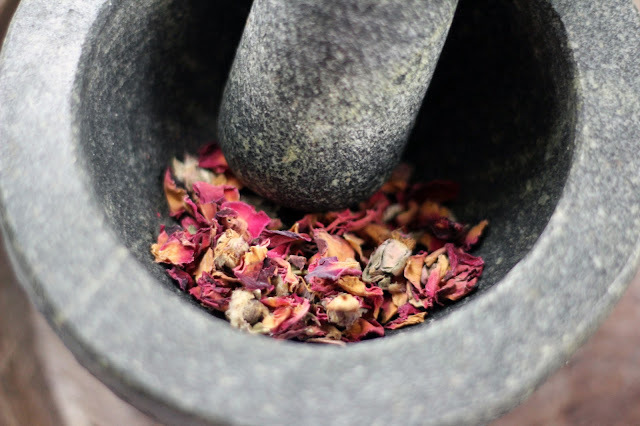 In the past, I’ve been rather timid to cook with rose water, preferring to use it as a perfume or skin tonic. Perhaps I’ve used too much, leading to a soapy flavor. But as I’ve said before, I appreciate being challenged and discovering something new. Several months ago I made the harissa recipe in Jerusalem: A Cookbook and was immediately hooked. I look for any opportunity to open the jar so had already marked the Panfried Sea Bass with Harissa and Rose. The halibut at our fish counter looked beautiful, so I used it in place of the sea bass. 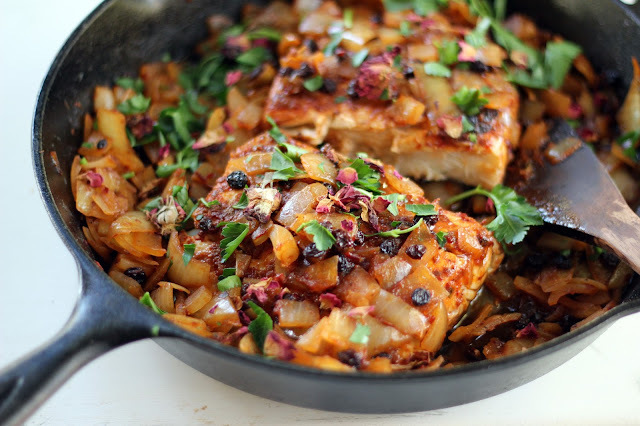 A myriad of flavors mingled delightfully in the finished dish, with spicy harissa, sweet honey and currants, onions, the acidity of vinegar and a hint of rose water. A scattering of rose petals on top is pretty, too! Cardamom Rice Pudding with Pistachios and Rose Water was my next foray into rose water. For the pudding, I used half and half since I already had some on hand (in place of whole milk and cream), and skipped the condensed milk since I did not have any on hand. I also used short grain brown rice, and upon reflection should have known to cook it a bit longer since it was rather too al dente. The rose water added a delicate note, and the honey and rose syrup to drizzle is quite nice. Needless to say, it was all eaten! I pulled out my grandmother’s china cups to serve it in, since I think a pudding with rose petals warrants fancy tea cups. 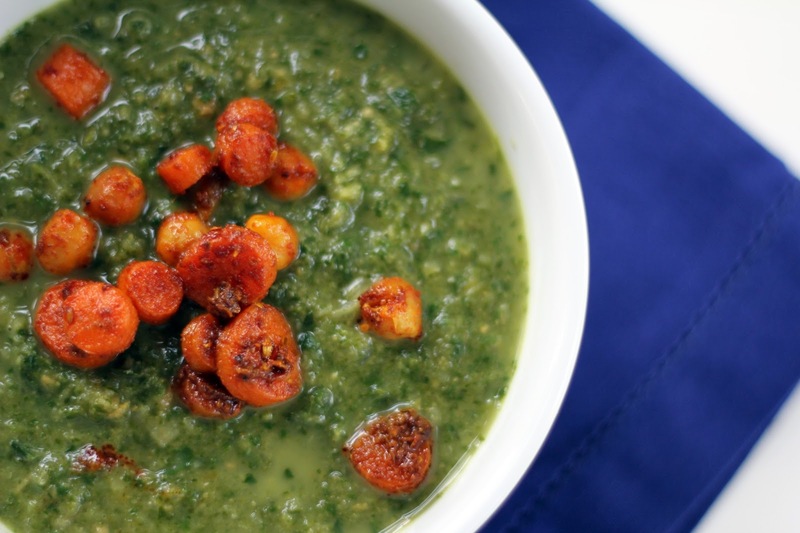 My friends Debbie and Margot each made the Watercress and Chickpea Soup with Rose Water and Ras el Hanout and quite enjoyed it, so based on their recommendation I knew I would, too. This is a marvelous bowl of green! Fresh spinach and watercress are briefly cooked and whirled together with chickpeas, onions, ginger and a few drops of rose water and topped with chickpeas and carrots roasted with a spice blend called ras el hanout. I’ve already made the soup two times. The second time I left out the ginger as my family felt it overwhelmed the other flavors, and as much as I like ginger I found I preferred it this way myself. If you make this, do yourself a favor and just double or triple the carrots and chickpeas from the start since you’ll be nibbling away on them. 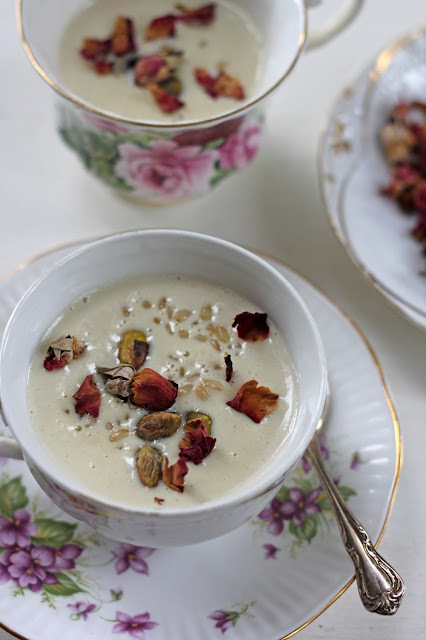 The rose water subtly perfumed the soup in a pleasing way. At Margot’s suggestion, I made my own ras el hanout spice mix. 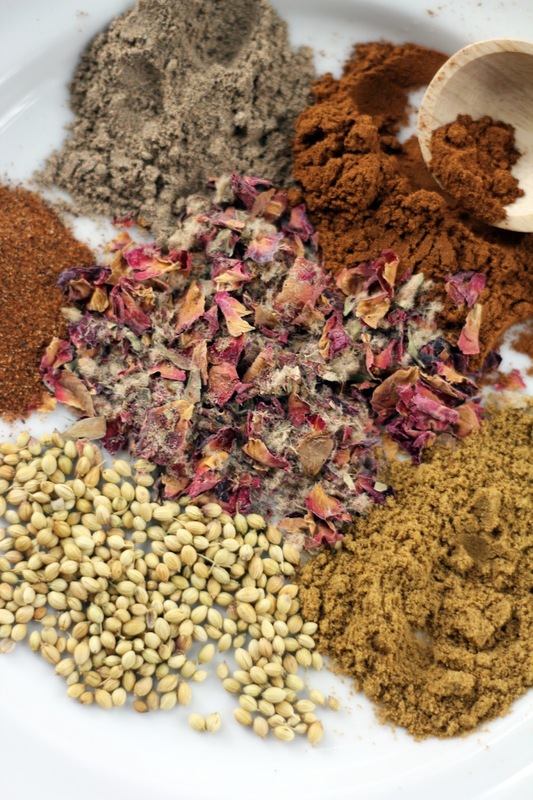 Ras el hanout is Moroccan in origin and is Arabic for “head of the shop.” There are many variations of this mix, sometimes using up to twenty spices, and each spice shop has its own version. I decided to be like the spice vendors and create my own blend. Plus, I love any opportunity to use my mortar and pestle! I toasted some cumin seeds and coriander seeds until they were fragrant, then pounded them together with cinnamon, turmeric, ginger, pepper and paprika. 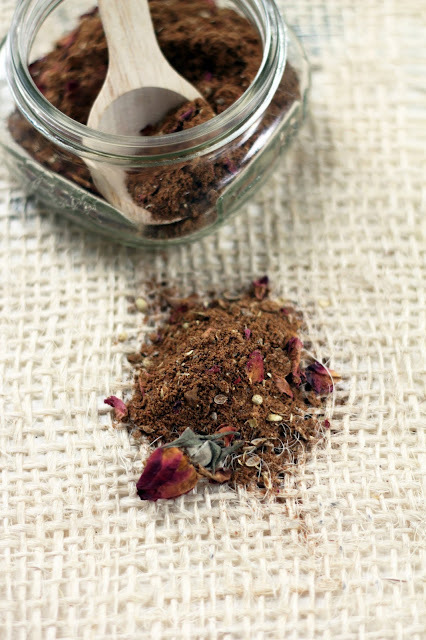 Earthy and warm, this is a mix I’ll be reaching for many times. This next dish does not involve roses in any way, but it was my husband and sons’ favorite snack that I made from Jerusalem in February (other than copious amounts of hummus) so I recommend it. 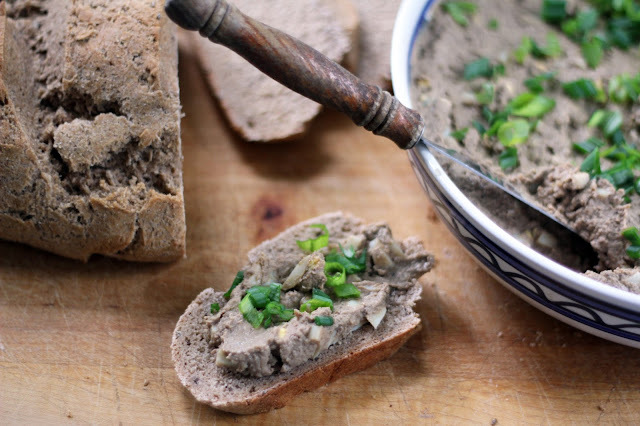 Chopped liver! This was my first time making anything with chicken livers, but one of the goals of Tasting Jerusalem is to try new ingredients and I am doing just that. Bob, Sam and Isaac loved it. I served it during the Super Bowl with homemade sourdough rye bread and it disappeared. It is rich, filled with onions and eggs, and I’ll be making it again for my men. In a small pan, toast the cumin seeds over high heat until they become fragrant, about a minute or two (take care not to burn them). Grind with a mortar and pestle or spice grinder. Pour the ground seeds into a small bowl. Next toast the coriander seeds in the same pan over high heat until they, too, become fragrant. Grind the seeds and add to the cumin seeds. Add the rest of the spices and stir gently to combine. 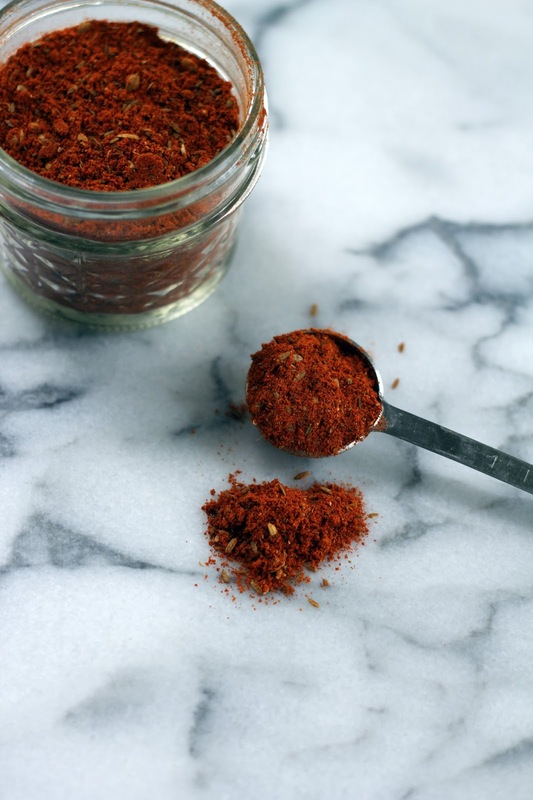 Store the spice blend in a covered jar for several months. Use it to jazz up roasted veggies, stews, flavor meat or season legumes.